There are many ways to go wrong when youre prospecting via email. Here are the top 10 things to avoid in your prospecting email. 1. Make it hard to opt out. Make sure you have a simple “unsubscribe” link and quickly remove anyone who wishes be deleted. See how bad those capital letters look? Don’t shout in your subject line or the body of your email. If you are attempting to market a professional product or service, do not use gimmicky colored text. 4. Use lots of bold or italic fonts. Bold and italic fonts are not off limits, but use them sparingly. A phrase or two at most. 6. Go on and on. People are busy; be brief. A few sentences, a few bullets, a call to action — that’s it. No page-long lectures. 7. Include a complicated call to action. If you have someone’s attention, make it quick and easy for them to take action. Make sure the prospect will receive a real benefit by answering your call to action. 9. Avoid a professional salutation. Please use “sincerely” or “best regards” and your real name and title. If your email ends with a cheesy motivational quote and a promise to change my life, I will move on to a professional. 10. Make it hard to opt out. This is so important, I am listing it twice. The easiest way to earn spam complaints is to make it difficult to get off your list. Include a clear and prominent way to opt out. 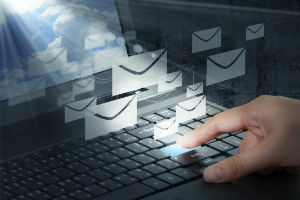 Get the most out of your prospecting efforts with a professional, well-designed email.